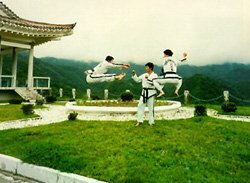 The Hornet Taekwondo Club - Taekwondo at it's best. The Hornet Taekwondo Club is Selby's premier martial arts club and holds Taekwondo classes at many of the local area halls and community centres. The Club was formed in the August of 2000 when 3rd Dan Black belt Dave Baugh put his successful competition career behind him to concentrate on coaching. In this short space of time, the club has made a dramatic impact with students winning many competitions and working their way through the coloured belts that prove their commitment to this exciting and rewarding martial art. The Hornet Taekwondo Club is BTC (British Taekwondo Council) recognised and BTCB (British Taekwondo Control Board ) affiliate members. This means we can offer access to junior and senior national squads in both Kyorugi (sparring) and Poomsae ( patterns). The aim of the Hornet Taekwondo Club is to deliver this exciting martial art and olympic sport to people of all ages and ability, develop them technically, physically and mentally and to encourage them to achieve their own personal goals.